For movies that are part of the Harry Potter universe, having a title that could pass focus-group muster clearly isn’t much of a concern. Whether the handle is something as multiplex-ready as “Chamber of Secrets” or as alien as “Prisoner of Azkaban,” if it comes from the mind of Potter creator J.K. Rowling it’s bound to be big. But again, about that title — after the 2016 series launch, “Fantastic Beasts and Where to Find Them,” might not the author herself have considered name-checking Newt right up top? After all, it certainly made story sense — and marketing sense — to follow up “Raiders of the Lost Ark,” say, with “Indiana Jones and the Temple of Doom,” etc. Except that beasts are definitely back in the mix here — everything from Chinese mythology’s feline Zouwu to an entire brood of those duck-billed, bling-addicted Nifflers; and from a cursed changeling with Voldemort ties to, metaphorically at least, Grindelwald’s scary band of supremacists. 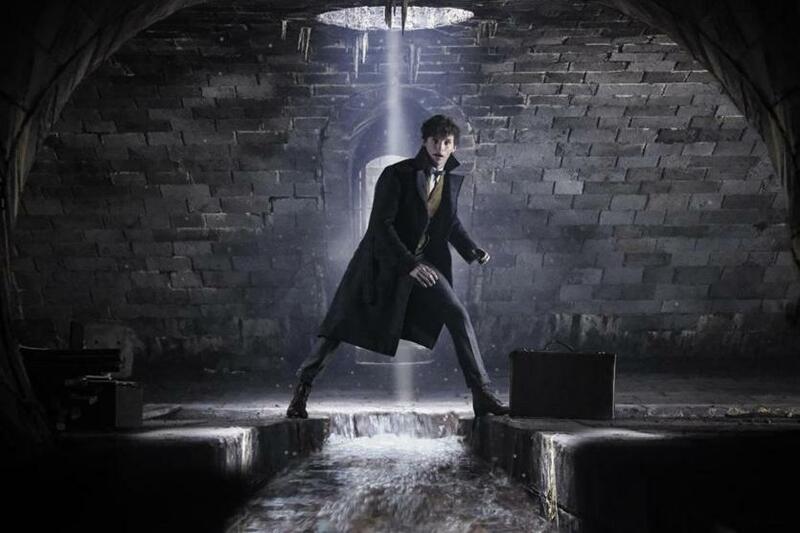 Eddie Redmayne returns in his role as Newt Scamander in the “Fantastic Beasts” sequel. Also, the story is as much an ensemble piece as it is Newt’s latest adventure. The plot threads and character arcs are so numerous, in fact, that if Rowling were conjuring them all up in a novel rather than a screenplay, she may well have topped her bookshelf-buckling “Harry Potter” page counts. Take the maneuverings of young Dumbledore — or “hot Dumbledore,” as some have amusingly tagged Law’s version of the character. The future Hogwarts headmaster wants his erstwhile student Newt to confront Grindelwald for him, never mind the knotty logistics involved. To wit: The dark wizard is in Paris, racing Newt’s plucky love interest, Tina Goldstein (Katherine Waterston), and others to find powerful, troubled Credence Barebone (Ezra Miller). Trick is, the British Ministry of Magic has grounded Newt in London for his first-installment exploits abroad. Johnny Depp stars as Gellert Grindelwald, the foil of Albus Dumbledore. Meanwhile, the first movie’s B-story meet-cuties, New Yawk “No-Maj” Jacob Kowalski (Dan Fogler) and bubbly mind-reader Queenie Goldstein (Alison Sudol), are back, but this time their taboo mixed relationship frequently takes center stage, and some startling turns. Impressive stuff, especially given that the movie also covers Newt and Tina’s accidental estrangement, as well as the uncomfortable triangle existing among Newt, bureaucratic big bro Theseus (Callum Turner), and Zoe Kravitz’s Leta Lestrange. For Law, the artistic mandate was all about legacy: to deliver a performance that was consistent with Richard Harris’s and Michael Gambon’s interpretations of Dumbledore, but also something fresher than simple mimicry. “I went back and watched their performances, obviously,” he says. “The character is so beloved, I recognized the responsibility to get it right. Jude Law (center) as a young Albus Dumbledore. All of which could be just the thing to help Law achieve the effect that he, personally, is after, the imprint he hopes to have made on Dumbledore’s iconography when the “Fantastic Beasts” saga is all said and done. “Even though Harris and Gambon both have a serenity, a wisdom, and a mischievousness, they also have a sadness to them,” Law observes.